To make the lamb ragu: In a large Dutch oven (or slow-cooker), combine the lamb, tomatoes and their juice, tomato paste, onion, oregano, garlic, and salt. Bring to a boil over medium-high heat, then reduce to low and slowly simmer, covered, until the meat is very tender and shreds easily, 4 to 6 hours. (In a slow cooker, just combine everything and cook on high for 4 to 6 hours or low for 6 to 8 hours.) Once tender, shred the meat and stir it into the sauce (gently pressing the meat with a potato masher works well for this). If the sauce seems too runny, continue simmering for 5 to 10 minutes uncovered to thicken slightly. Taste and adjust the seasoning with more salt as needed. To make the filling: In a large bowl, combine the ricotta, mozzarella, parmesan, basil, parsley, eggs, salt, and pepper until smooth. Cover and refrigerate until needed. 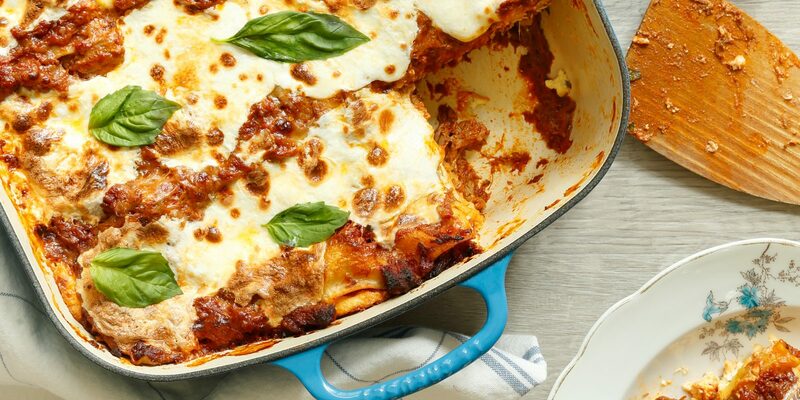 To assemble the lasagna: When the lamb ragu is ready, preheat the oven to 375˚F (190˚C). Grease a large roasting pan, preferably one that’s 14 inches by 10 inches (or two smaller casserole dishes), with olive oil. Spread 1/4 of the sauce on the bottom of the pan and top with 1/4 of the lasagna noodles followed by 1/2 of the ricotta mixture. Top with another 1/4 of the lasagna noodles, followed by 1/4 of the sauce and 1/4 of the lasagna noodles. Next, top with the remaining ricotta mixture, then 1/4 of the sauce. Finish with the remaining noodles and sauce. Sprinkle the top with the parmesan, then arrange the mozzarella slices in a single layer. Lightly spray a piece of foil with cooking spray, cover the lasagna, and bake until hot and bubbly and the cheese on top is melted, about 45 minutes. Switch the oven to broil. Remove the foil and position the lasagna so that the top is about 4-inches from the broiler. Broil until the cheese is crusty around the edges and blistered in spots, 3 to 5 minutes. Remove from the oven and rest about 10 minutes. Slice into 12 large squares, top each with a basil leaf, and serve with Chianti Classico.